The MPIRICA Quality Score allows consumers to compare facilities and surgeons at the procedure level. The Quality Score rates surgeons and hospitals by what matters most: their results. The Quality Score incorporates measures like risk-adjusted complications, mortality and readmission rates over a 90-day period to assign providers a score between 100 and 800 – similar to a credit score. 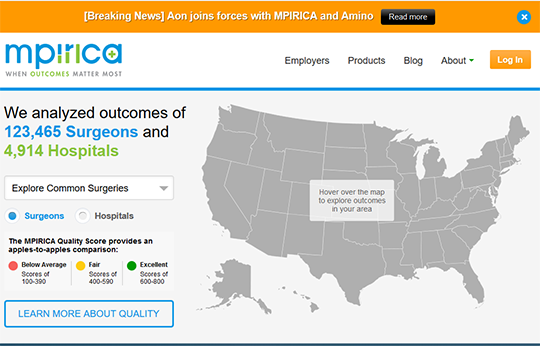 MPIRICA’s quality scores covers 864 procedures, over 123,465 physicians and 4,914 hospitals nationwide. Access to MPIRICA’s Quality Score requires paid-subscription.